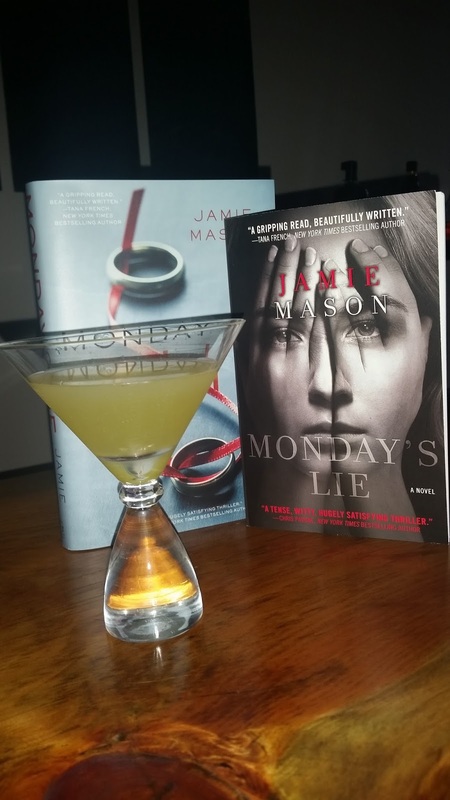 Jaime Mason joins us today for Drinks with Reads matching her novel, Monday's Lie with the perfect drink. I recently met Jaime at Bouchercon where we bonded over chocolate eyeballs. Once you pick up Monday's Lie, you won't put it down. Well, this is fun. Drinks with reads. I like it. And what’s not to like? In thinking about it, I hadn’t realized that a few key scenes in Monday’s Lie hinged on drinking. Dee and her brother, Simon, meet over drinks more than once to work and worry at Dee’s troubles. Dee and her husband Patrick have their marriage implode over Pinot Noir. 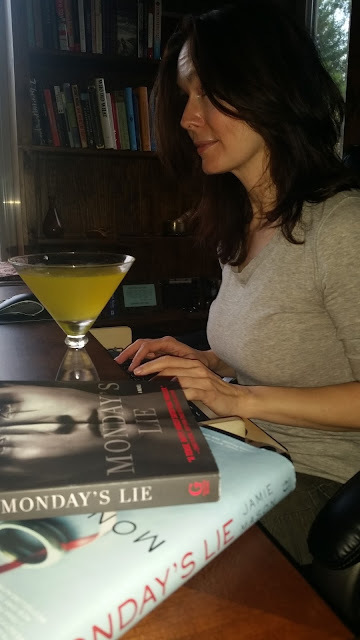 And in one of my favorite scenes in the book, Dee pays off a bartender and pretends to drink quite a number of vodka-cranberries in a ploy to neutralize a meddlesome character out of her plans to find out what the hell is going so desperately wrong in her life. But for Drinks with Reads, I have to nod to one of the best times I’ve ever had writing – getting to know black ops asset, Annette Vess. She’s Dee’s mother and, although she’s passed away a few years before the book’s main action, she’s very much alive in memory. Some people even find her the main character, and I can’t entirely disagree. Dee has to bring her back to life in her mind, to remember all that she taught her in order to unravel the mess that’s come from Dee constant denial of her true nature. And, anyway, Dee’s never been sure how much her husband always wished she’d be a bit more like her mysterious, wise, and witty mother. As often as I cited her as the cause for my troubles, though, thoughts of my mother propped me up through the twitchy awkwardness of reconciling with Patrick. Unlike me, I’m not sure she had been capable of feeling graceless. Merely remembering her made me stand taller, and replaying the stories she told, and the way she told them, it guided me to the right things to say. He thawed when I mimicked her. So I mimicked her. My mother celebrated the first bloom of daffodils with a vodka-gimlet party. The challenge was to drink the exact amount of Grey Goose and lime juice, and not a sip more, that that would leave you as sunny between the ears as the little green-sworded, lion-headed harbingers of spring looked on the lawn’s border. I smiled over our good-byes and sagged, both happy and sad, back into my office chair. I’d win him over first, then tempt myself back into line. I liked the idea of Daffodil Gimlets used to shake off winter enough that it’s now a thing in my house. If you hurry, you could try one on, before the cold really sets in for Winter 2015. You know, just for practice before we come out the other side. Let’s do this in 2016, when Old Man Winter gets ridden out of town. Add together over ice, give the whole works three stout shakes, and strain into a martini glass --- and you’re golden. Thank you for a great post. Loved the book.